— The Winter issue of RACER — celebrating 50 years of IMSA — delivered the highest revenue of any RACER issue ever published. Thank you to all advertisers and partners who commissioned custom content sections, including IMSA, Cadillac, BMW, Lexus, Michelin, Yokohama, Monster Energy, Lucas Oil and Spring Mountain. — RACER’s Spring 2019 Season Preview issue was another success with a special content section celebrating the 30th Anniversary season of the new-look Blancpain GT World Challenge America series along with a 68-page NTT IndyCar Series special issue, which is the fifth we’ve produced for the series since 2015. 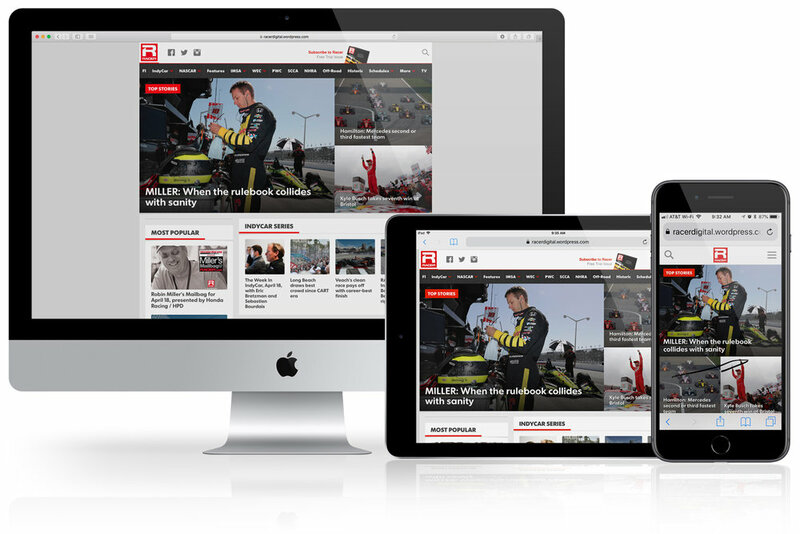 — RACER.com continues to grow, driven by our great roster of contributors including Robin Miller, Marshall Pruett, Chris Medland, Kelly Crandall, Richard James, Stephen Kilbey and Marty Fiolka as well as our amazing photographers. RACER.com saw a healthy 14% growth in unique users in 2018 versus 2017, averaging 344,000 monthly uniques. Even more impressive is the stout 27% rise in uniques from the USA during the same period. — 2019 is off to a strong start for RACER.com with a 12.66% growth in unique users during January and February, and an astonishing 42.71% spike in uniques from the USA during these months. — Our team is also grateful to be in our 36th year as publisher of SportsCarmagazine, which we produce for the 45,000 members of the Sports Car Club of America. SCCA celebrated its 75th Anniversary with the gala March 2019 issue. — The RACER Studio agency team has been very busy for the last 14 months producing the Official 50th Anniversary book for IMSA as well as numerous project for clients including Mazda, Toyota, Monster Energy and the Trans Am Series presented by Pirelli. — During the past year we’ve also announced content distribution and marketing alliances with the USA Today Sports Media Group and DRIVETRIBE.com to help us and our customers reach new audiences beyond the core motorsports fan. — You may have noticed that our coverage has expanded to include off-road and motorcycle racing. Based on initial audience reaction to this new content we are very optimistic that it will help us grow even more in the year ahead. Below are some upcoming issue deadlines for RACER and SportsCarmagazines, as well as links to our advertiser resource site and our RACER Studio site. The RACER team would welcome the opportunity to work with you and your team to reach the most passionate and engaged motorsports audiences in North America. John Chambers, Global Sales / motoring1@aol.com / +44.0.7770.643749.